From April 23-26, the Shanghai New International Expo Center in China will stage the largest ever edition of CHINAPLAS, the 28th International Exhibition on Plastics and Rubber. In order to lead in more high quality exhibitors, unprecedented exhibition suites are introduced in this edition, the organizer, Adsale Exhibition Services Ltd. announced. They are unique standalone booths located at prestige location in the central square of North wing and East wing. The sizes of the suites range from 150-300sqm, providing ample space for exhibitors to display their innovative products and provide fresh feel to win the curiosity of visitors. The spacious and comfort environment will be ideal meeting place for visitors to interact with exhibitors, understand the characteristics and features of the companies and their products. As these exhibition suites are located near entrance halls 1 and 2, visitors can access the suites conveniently. Currently, Bayer MaterialScience, Dow, Kolon Plastics, and Sunshow, Uniplas have confirmed to exhibit in these exhibition suites. Besides there is also an upgraded service for long term supporting buyers. The “CHINAPLAS Elite Club Lounge”, an exclusive area for invited premium visitors, will be established outside hall E4, which is an eye-catching location. It provides pleasant and comfortable resting area for our premium buyers to take a break after frequent meetings in large-scale exhibition. Visitors can also enjoy free services including WiFi and computer stations for internet access, magazines and newspapers, refreshment and power station for electronic device in the lounge. To facilitate visitors’ product searching experience over an immense exhibition area, some products are sub-classified under the major theme zones and highlighted at the fairground. For example, at the Chemicals and Raw Materials Zone, Color Pigment and Masterbatch will be located at additional exhibition hall C10 and Additives at hall C11. More details classifications can be found at the four types of Visitor Guides which can be obtained on-site and one month before show on the show website. 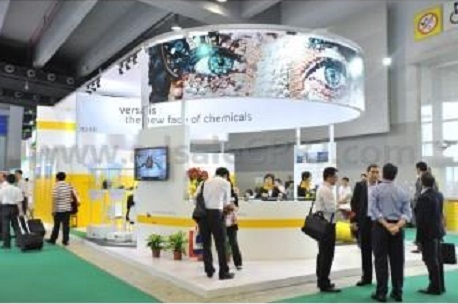 With the continuous overwhelming response, CHINAPLAS 2014 is expected to host more than 2,900 exhibitors, occupying an exhibition area of over 220,000sqm, with strong presence of international pavilions from Austria, Canada, France, Germany, Hong Kong, Italy, Japan, Korea, Switzerland, Turkey, the UK, the US, China and Taiwan. To cater for the pressing demand for exhibition space, 12 additional exhibition halls will be set up in the central square of the exhibition center, aiming at serving the requests of exhibitors, explained the organizer. “We always aim at enhancing and improving our services for the exhibitors and visitors. The Exhibition Suite and the Elite Club Lounge are two of the major upgraded services. We hope that visitors not only find the right suppliers and acquire the latest technology here, but also visit this mega show more comfortably and easily. Since the show scale is large, visitors are encouraged to plan their visit earlier and better stay the whole four days in order to grasp the most and best of the information here,” says Ada Leung, Assistant General Manager, Sales & Marketing, Adsale Exhibition Services Ltd. The entry tickets have two types, namely one-day pass (RMB 30) and four-day pass (RMB 50). Visitors who successfully pre-registered at www.ChinaplasOnline.com/prereg on or before February 17 will enjoy RMB 150 privileges including free admission with visitor badges being received in advance, plus a free coupon to redeem exhibition catalogue. Besides, pre-registered visitors can also enjoy the function of “My Exhibitor” through official website and CHINAPLAS’ app. It helps them to select their own exhibitors from the exhibitor list and take note on each choice. The exhibitor list and app will be launched in early 2014.